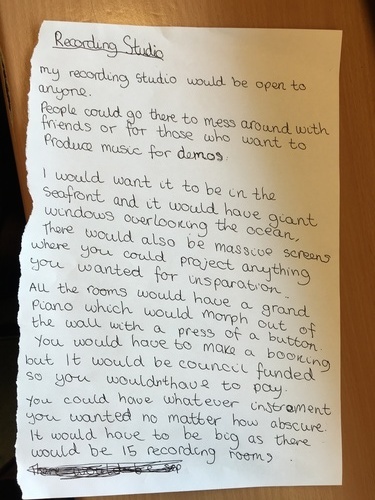 We informed the young people that they were in a rare position to make suggestions to Brighton and Hove City representatives as to what weird and wonderful new music facilities they might build. We gave some examples ourselves and then filled the board with their ideas which came pouring out. We (the leaders, spoken word artists) then improvised a quick song to extrapolate their concepts and weave them together. After that, we asked them to flesh their ideas out on paper, in rhyme if they liked, so that we could perform them together at the end. 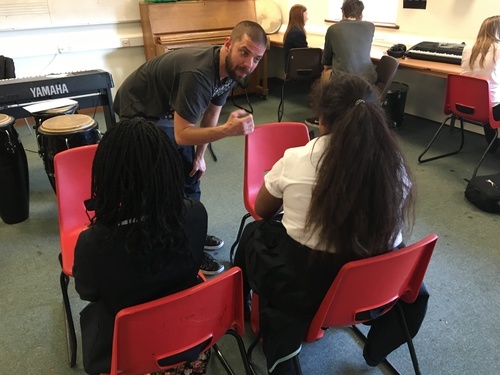 We left the beat playing quietly while they went to work and finally they recorded their voices into an Edirol mic in front of their classmates. There were 7 girls and 1 boy, all from different parts of Brighton (Whitehawk, Moulsecoombe, Portslade). They were very encouraging of each other’s ideas and helped to bounce them. It seemed that even the shyest members were willing to have a go at performing and were not scared to ask for help writing. The response was overwhelming. Everyone kept coming up with ideas. It was like a burst water main full of magic. The great success for me was the lack of self consciousness in the room. I think they felt it too. At the end they asked if they could do this every week. Maybe just time. If we’d had 2 hours then we could have gotten better recordings to document it with. I think they learned to be free in their expression and to value their imaginations for the beginning of a practical undertaking. They learned how to develop ideas in a think tank. They were exposed to freestyle improvisation which can open up a new realm for young people. I think they learned what they would like more of! What were the positive or negative outcomes of the Youth Voice session? There were only positive outcomes. They came away feeling like their ideas might just come true in Brighton one of these days. They all fired off into a storm of possibilities which was running away with itself. I reckon they felt free in that hour and it showed them what life can be like if you want it to be. I’d get a better recording at the end and would have all their verses back to back on the same track so that they could hear it sounding professional after the fact. Maybe I’d invite them to freestyle too if there was more time. Big ideas for Brighton musical facilities. Spoken word artists: to inspire the kids to let loose their imaginations and to closely document what they come out with.